This charming illustration of life in Normandy in the second half of the 19th century is as fresh today as when it was painted. Despite its commonplace subject – although some have discerned complex sociological thinking in this wedding scene – the painting has acquired immense celebrity over the years. And it is true, this slice of life is full of lively appeal. At the time, the painter, Albert Fourié, was accused of having worked in his studio from a photograph. But as it happens, there is a photograph of the artist, outdoors, standing by his unfinished painting. The story is a good example of how far photography had become a rival to painting at the time. 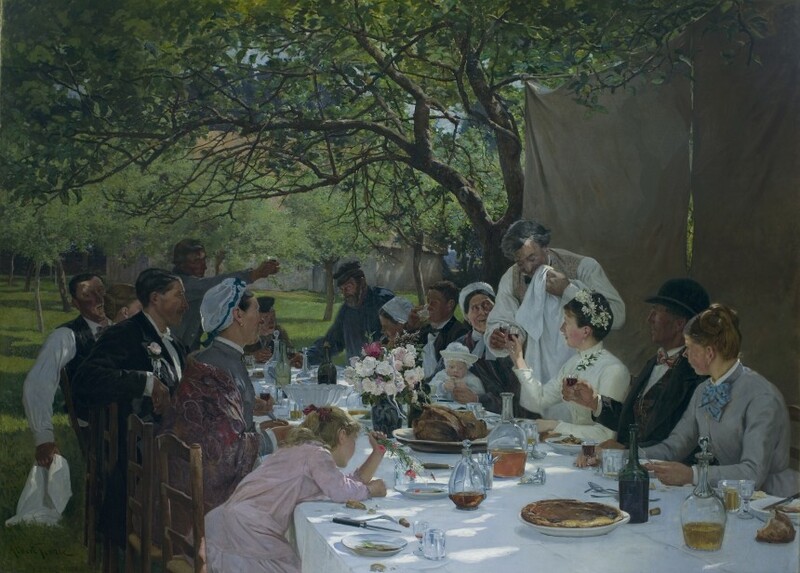 Another indication of this was the suggestion that Fourié had placed his canvas beneath the trees – as in the above-mentioned photograph – in order to more effectively render the effect of light falling through the leaves in patches on the table where the guests are eating. In any event, the painter certainly came close to photography in his desire to capture the faces and attitudes in an instant, directly reflecting this technique. Faced with this competition, many painters turned to Impressionism. But Albert Fourié was not one of them. A pupil of Jean-Paul Laurens at the Académie Julian, he remained faithful to tradition, taking inspiration from photography, while giving his work undeniable charm through a soft, mellow style quiet different from the direct and forceful rendering of a mechanical image.